After spewing shards of aggro guitar in the influential San Francisco Bay Area punk outfits Screaming Bloody Marys (1986-1997) and Cell Block 5 (1999-present), guitarist/vocalist Dave Dalton discovered the acoustic dobro and surrendered to the quieter, but no less subversive call of his Celtic-folk roots. 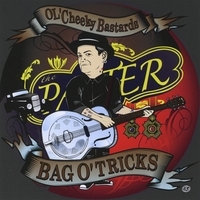 The result is Bag O'Tricks-an acoustic-based celebration of grit and cautious bliss inspired by the Pogues and Dalton's tough-as-nails British childhood. Produced by Michael Molenda,current Editor in Chief of Guitar Player magazine, and seminal San Francisco punk rocker (Silhouette, Wobblies) the album employs subtle cinematic elements to add dimension to Dalton's impassioned voice and acoustic playing, while simultaneously leaving the music raw and unbowed by technology. This is a truly genuine album that adheres to the usually false proclamation of "keeping it real"
All of Dalton's vocals and guitar parts were recorded live in one take to ensure that his compelling stories and daft busker sensibilities were captured as they were delivered in single, unabridged stream-of-consciousness outbursts. This is a haunting, sad, hilarious, and thought-provoking work. Daveo Lester here this record here is great!! !Its working class man!!!!! Scooter Boy!! !Mi Hijo Mi Futuro Mi Vida..very good!! !